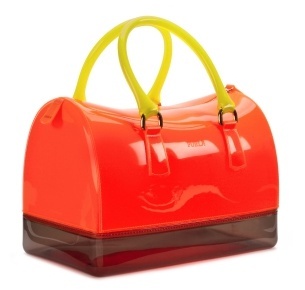 Have you seen these Candy handbags from Furla? They kind of remind of those see-through handbags you used to see some shop employees carrying way back when I was in high school. Well, they remind of a way cooler version of that. At $228 US or £185 a pop for these sweets, you'd expect more than just a plastic bag. These come in a rainbow of colours. 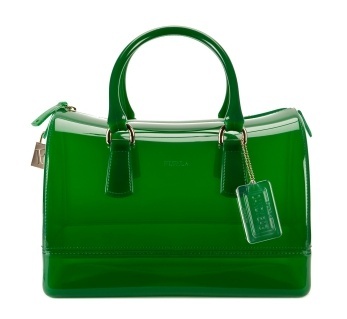 Furla's website has a really cool video where you can see a variety of these handbags here. So, what do you think? I think they look really cool. I'm a fan of this shape for handbags. They are also really sturdy, and the PVC makes them ideal for rainy city living. Also, I think it's a cool alternative to leather, if that's your thing. The downside for me is I'm not really sure I can handle paying £185 for a plastic bag. I guess until I make my mind up I'll stick to this mini version. It's actually a keychain replica of the candy handbag (£40.00). Adorable.